South Korean Foreign Minister Kang Kyung-wha met Tuesday with a visiting US nuclear envoy to discuss denuclearization and peace on the Korean Peninsula. South Korean Foreign Minister Kang Kyung-wha (R) shakes hands with US special representative for DPRK Stephen Biegun (L) during their meeting at the Foreign Ministry in Seoul on September 11, 2018. South Korean Foreign Minister Kang Kyung-wha met Tuesday with a visiting US nuclear envoy to discuss denuclearization and peace on the Korean Peninsula, Seoul's foreign ministry said. 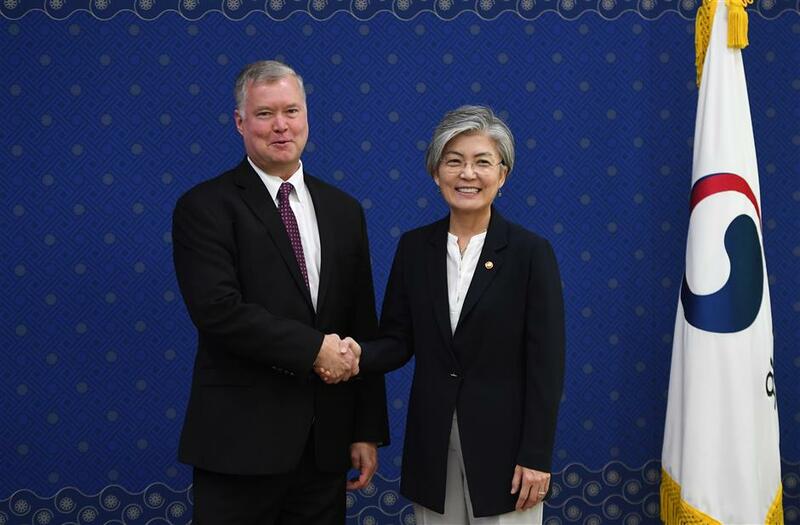 Kang held a meeting in Seoul with Stephen Biegun, US special representative for the Democratic People's Republic of Korea affairs, exchanging views about the improved inter-Korean relations and the outcome of the recent visit by South Korean President Moon Jae-in's special envoys to Pyongyang. During the meeting with Moon's special envoys last week, DPRK top leader Kim Jong Un reconfirmed his commitment to the complete denuclearization of the Korean Peninsula. The leaders of the two Koreas agreed to hold their third summit in Pyongyang for three days from Sept. 18. The top South Korean diplomat asked Biegun to play an active role to achieve the goal of completely denuclearizing the peninsula and building a permanent peace by continuing a positive progress in the peninsula situations. Biegun told Kang that he will fulfill his role to achieve the peninsula's complete denuclearization and the settlement of peace based on a firm US-South Korea alliance, vowing to continue close cooperation and consultations in each level between the two allies. Biegun also met with his South Korean counterpart Lee Do-hoon, special representative for Korean Peninsula peace and security affairs.